I started Bob Bradley Make-up because friends would compliment me on my use of make-up for an everyday look or more bold looks for parties and other occasions. My background in modelling gave me an insight into the work of make-up artists and so I picked up a lot of tips whilst working in the fashion industry. I have seen how make-up can give someone a lot of confidence and I really enjoy sharing my knowledge, I especially love to see women feeling and looking great when I leave them. I'm based in Wantage, Oxfordshire but travel to other locations if required. My services include make-up for special occasions such as weddings, engagements, parties & special events, birthdays & proms, fashion shoots & shows. I also offer a 'one-to-one' make-up consultation as well as simple make-up classes at your house or mine where we sit with a bunch of your friends and go through all those expensive things you have bought over the years that you don't use. I speak from experience....we all do it! It is very simple to learn how to make the most of the contents of your make-up bag. 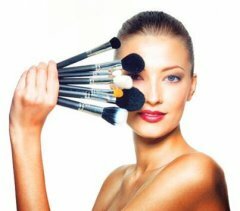 Click here to read more about the make-up classes & consultations.